Messier 25 (M25, IC 4725) is one of the more remarkable open clusters in constellation Sagittarius. Although a conspicuous cluster, even in the smallest telescopes or opera glasses, M25 has only obtained an IC number. This is because due to unknown reason, John Herschel did not include it in his General Catalog, although it had been observed by de Chéseaux in 1745-46, Charles Messier in 1764 (added to his catalog on June 20, 1764), added to the 1777 catalog of Johann Elert Bode, observed by William Herschel (1783) and Admiral Smyth (1836), and by Reverend Thomas William Webb (1859). According to Kenneth Glyn Jones, it was finally rediscovered by Julius Schmidt (1825-84) in 1866, but the present author [hf] could not yet verify this presumed rediscovery, despite studies e.g. of the Astronomische Nachrichten of that years. Eventually, M25 was added to the second Index Catalog by J.L.E. Dreyer in 1908, based on photographic observations and using a position obtained by Solon Irving Bailey (1854-1931), published in Bailey (1908). 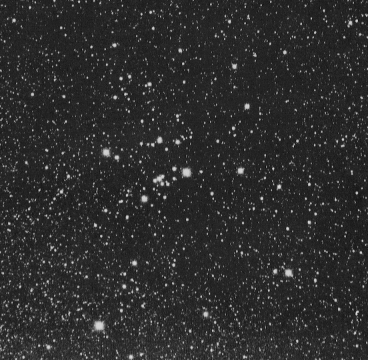 Two giants of spectral type M and two of type G can be found in this cluster, where the G type giants appear to be actual members (the M's not). Moreover contains the variable star U Sagittarii of type Delta Cephei, which has a period of 6.74 days, a typical period for these variables "in our neighborhood," as Cecilia Payne-Gaposhkin put it. It was discovered by J.B. Irwin in 1956, its membership was confirmed by radial velocity measurements conducted by M.W. Feast of Radcliffs Observatory (the common RV of the cluster members is +4 km/sec). The occurance of the Delta Cephei star is consistent with the fact that it is not a very young cluster, its age may be about 90 million years (the Sky Catalog 2000 gives 89 million). Also, as the distance of M25 is quite wellknown by other means, U Cephei can by used as one gauging point of the famous, so-called Cepheid distance scale, which is used for distance determinations of nearby galaxies. One other such case is known: That of the Delta Cephei star U Normae in open cluster NGC 6087. The sources agree unusually well in this cluster's distance and give about 2,000 light-years. This makes its 32 arc minute diameter corresponding to about 19 light-years. Archinal and Hynes (2003) give a slightly larger distance, 2,300 light-years, which would raise the 32' linear extension of about 21 light-years, but these authors give a smaller angular diameter of 26', which would then correspond to a linear diameter of 17 light-years. 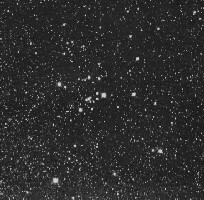 Ake Wallenquist (1959), who estimated its diameter at 34', counted 86 probable members of this cluster. Archinal/Hynes and the Deep Sky Field Guide give the much larger number of 601 member stars. While the Sky Catalog 2000 gives its Trumpler type as I,2,p, Götz classifies it as I,3,m, and Kenneth Glyn Jones quotes Trumpler with IV,3,r. Quite a difference ! Brent A. Archinal estimates it as III,3,m (Archinal and Hynes 2003). In 2012, from July to November, dwarf planet Pluto is moving very close south of star cluster M25, with formally closest approach around July 21, and another somewhat larger minimum in angular separation around November 10; this occurs just two years after that planet's passage across M24.